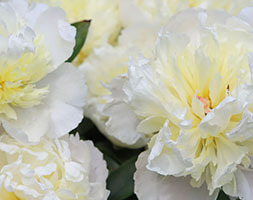 Elegant summer flowers with pink flushed creamy-white outer petals and tiny, canary-yellow, incurving, inner petals. This delicately scented white peony is ideal for an open sunny border. The deeply cut pale to mid-green leaves are excellent for masking the faded foliage of early spring flowering bulbs.